Increased dietary salt intake can induce a group of aggressive immune cells that are involved in triggering and sustaining autoimmune diseases. This is the result of a study conducted by an international group of scientists, including ones from Yale University, the Broad Institute, MIT, Harvard University, Vanderbilt University, the Max-Delbrück Center for Molecular Medicine in Berlin, and the University of Erlangen-Nuremberg, among others. The authors of the report, which was published online in Nature on March 6, 2013, included Dr. Markus Kleinewietfeld, Professor David Hafler, Dr. Ralf Linker, Professor Jens Titze, and Professor Dominik N. Müller. A second study, published on the same day in Nature, describes how a salt-sensing enzyme might be involved in the induction of autoimmune disease. A third study, also published on the same day in Nature, describes the molecular pathways involving T helper cells that can lead to autoimmune disease. Together, this suite of three Nature articles may significantly advance our understanding of the origins of autoimmune disease. The focus here is on the first article on the effects of excess dietary salt. In recent decades, scientists have observed a steady rise in the incidence of autoimmune diseases in the Western world. Because this increase cannot be explained solely by genetic factors, researchers hypothesize that the sharp increase in these diseases is linked to environmental factors. Among the suspected culprits are changes in lifestyle and dietary habits in developed countries, where highly processed food and fast food are often on the daily menu. These foods tend to have substantially higher salt content than home-cooked meals. Scientists at the Salk Institute for Biological Studies in La Jolla, California, have identified patterns of epigenomic diversity that not only allow plants to adapt to various environments, but could also benefit crop production and the study of human diseases. Published online on March 6, 2013 in Nature, the findings show that in addition to genetic diversity found in plants throughout the world, their epigenomic makeup is as varied as the environments in which they are found. Epigenomics is the study of the pattern of chemical markers that serve as a regulatory layer on top of the DNA sequence. Depending on where they grow, the plants' epigenomic differences may allow them to rapidly adapt to their environments. Epigenomic modifications alter gene expression without changing the letters of the DNA alphabet (A-T-C-G), providing cells with an additional tool to fine-tune how genes control the cellular machinery. These changes occur not only in plants, but in humans as well. "We looked at plants collected from around the world and found that their epigenomes are surprisingly different," says senior author Dr. Joseph R. Ecker, a professor in Salk's Plant Biology Laboratory and holder of the Salk International Council Chair in Genetics. "This additional diversity may create a way for plants to rapidly adapt to diverse environments without any genetic change in their DNA, which takes a very long time." By understanding epigenomic alterations in plants, scientists may be able to manipulate them for various purposes, including biofuels and creating crops that can withstand stressful events such as drought. Cornell University researchers have discovered a likely origin of epithelial ovarian cancer (ovarian carcinoma), the fifth leading cause of cancer death among women in the United States. Pinpointing where this cancer originates has been difficult because 70 percent of patients are in advanced stages of disease by the time it is detected. Because the origin of ovarian carcinoma development is unknown, early diagnostic tests have so far been unsuccessful. Some epithelial cancers are known to occur in transitional zones between two types of epithelium (layers of tissue that line the body and organs and form glands), while others originate in epithelial tissue stem cells. Many organs have the capacity for regeneration, which is done by adult stem cells located in areas of each organ called stem cell niches. With this knowledge, the researchers discovered a novel stem cell niche for the ovarian surface epithelium in mice and showed that ovarian carcinoma preferentially originates from stem cells found in that niche, according to the study published online on March 6, 2013 in Nature. This stem cell niche lies in a transitional area known as the hilum region, a layer of cells that links the ovary to the rest of the body. "We now know where these cells are located in mice, so we can look in humans in those areas," said Dr. Alexander Nikitin, professor of pathology, leader of the Cornell Stem Cell Program and the Nature paper's senior author. Dr. Andrea Flesken-Nikitin, a postdoctoral researcher in Dr. Nikitin's lab, is the paper's lead author. The findings also provide a guide for scientists to look for stem cell niches and sources of cancer in other transitional zones in other organs, Dr. Nikitin added. A series of microRNA expression signatures that may help to define progression of the precancerous condition Barrett's esophagus into esophageal adenocarcinoma was reported in the March 2013 issue of Cancer Prevention Research, a journal of the American Association for Cancer Research. "Once a rare cancer representing only 5 percent of all esophageal cancers in the United States, esophageal adenocarcinoma is the cancer with the fastest-rising incidence — six-fold increase in the past three decades — and currently comprises more than 80 percent of all new esophageal cancer cases in this country," said Xifeng Wu, M.D., chair of the Department of Epidemiology, Division of Cancer Prevention and Population Sciences at The University of Texas MD Anderson Cancer Center, in Houston. "To reduce the mortality of esophageal adenocarcinoma, the best hope in the near term is to detect it at its early stage, or even better, to prevent the progression of esophageal adenocarcinoma from its premalignant lesion, which is called Barrett's esophagus." Dr. Wu and colleagues evaluated microRNAs, which are a class of small ribonucleic acids in cells capable of regulating a large number of genes. Research has shown that aberrant expression of microRNAs can be involved in cancer development. The researchers compared hundreds of microRNAs in normal esophageal epithelia and in Barrett's esophagus and esophageal adenocarcinoma tissues of different histological grades with distinct progression risks. They identified a number of differentially expressed microRNAs at each histological stage. "The expression of microRNAs in Barrett's esophagus and esophageal adenocarcinoma tissues was remarkably similar, indicating that the microRNA aberrations were very early events in the development of Barrett's esophagus," Dr. Wu said. Visceral fat, or fat stored deep in the abdominal cavity, is directly linked to an increased risk for colon cancer, according to data from a mouse study published in the March 2013 issue of Cancer Prevention Research, a journal of the American Association for Cancer Research. "There has been some skepticism as to whether obesity per se is a bona fide cancer risk factor, rather than the habits that fuel it, including a poor diet and a sedentary lifestyle," said Derek M. Huffman, Ph.D., postdoctoral fellow at the Institute for Aging Research at the Albert Einstein College of Medicine in the Bronx, New York. "Although those other lifestyle choices play a role, this study unequivocally demonstrates that visceral adiposity is causally linked to intestinal cancer." Prior research has shown that obesity markedly increases the likelihood of being diagnosed with and dying from many cancers. Dr. Huffman and colleagues sought to determine if removing visceral fat in mice genetically prone to developing colon cancer might prevent or lessen the development of these tumors. They randomly assigned the mice to one of three groups. Mice in the first group underwent a sham surgery and were allowed to eat an unrestricted "buffet style" diet for the entirety of the study, which resulted in these mice becoming obese. Those in the second group were also provided an unrestricted diet and became obese, but they had their visceral fat surgically removed at the outset of the study. Mice in the third group also underwent a sham surgery, but were provided only 60 percent of the calories consumed by the other mice in order to reduce their visceral fat by dieting. "Our sham-operated obese mice had the most visceral fat, developed the greatest number of intestinal tumors, and had the worst overall survival," Dr. Huffman said. Scientists have produced an instruction manual for the human genome that provides a framework to better understand the relationship between an individual’s genetic make-up and his or her lifestyle. The international team of researchers says their study – published online on March 3, 2013 in Nature Biotechnology – provides the best model yet to explain why individuals react differently to environmental factors such as diet or medication. “This research is the second important stage of our understanding of the human genome,” said study author Professor Pedro Mendes, from The University of Manchester’s School of Computer Science. “If the sequencing of the human genome provided us with a list of the biological parts, then our study explains how these parts operate within different individuals. The results provide a framework that will lead to a better understanding of how an individual’s lifestyle, such as diet, or a particular drug they may require is likely to affect them according to their specific genetic characteristics. 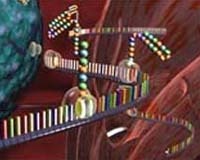 The model takes us an important step closer to what is termed ‘personalized medicine,’ where treatments are tailored according to the patient’s genetic information.” The research, which involved scientists from Manchester, Cambridge, Edinburgh, Reykjavik, San Diego, Berlin, and other locations, mapped 65 different human cell types and half of the 2,600 enzymes that are known drug targets in order to produce the network model. Co-author Dr. Douglas Kell, Chief Executive of the Biotechnology and Biological Sciences Research Council (BBSRC) and Professor of Bioanalytical Science at the Manchester Institute of Biotechnology, said, "To understand the behaviour of a system, one must have a model of it.